Road users are being invited to share their views on plans to dual a section of the A47 in Peterborough. There have long been calls for the road to be turned into a dual carriageway following a number of serious accidents in the past, including the crash in 2013 which killed couple Stephen and Samantha Durber. Highways England announced its preferred route for upgrading the A47 between Wansford and Sutton from single to dual carriageway in August 2017, as part of a £300 million upgrade of the key route connecting East Anglia with the Midlands. The works are set to start in 2020, and finish a year later, with the scheme set to cost between £50 million and £100 million. Following a previous consultation, the option selected will see a new stretch of dual carriageway built around half a mile to the north of the existing A47 at the western end, before crossing to the south at the eastern end to join the existing dual carriageway at Nene Way. 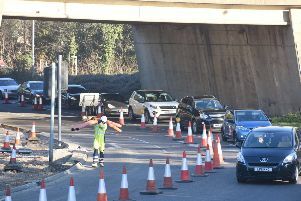 The dual carriageway section is expected to improve journey times by up to four minutes and halve the number of accidents that injure road users. Highways England programme lead for the A47, Guy Lewis, said: “We used your feedback from the first stage of consultation we did last year to choose the best route for this new dual carriageway, which our studies have shown is needed for this stretch of the A47. “We hope road users participate fully in this next stage consultation too to help refine our plans for this investment and deliver the best road.